“For me, personally, this issue of voting age is directly linked to the issue of violence which I'm experiencing as a minor almost every day," she said. South Korea is currently the only country among the Organization for Economic Cooperation and Development where the voting age is 19. 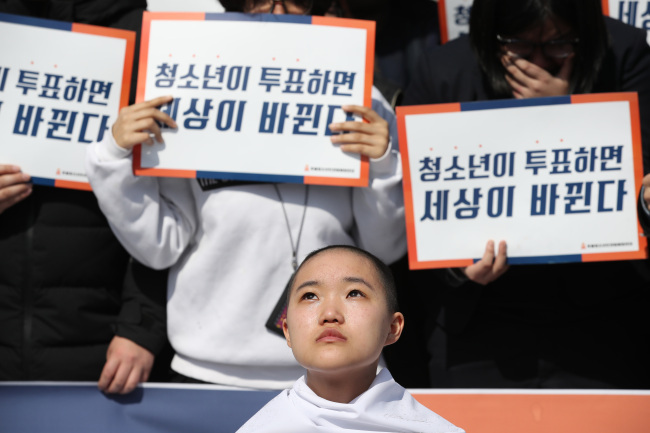 The same day Kim and her colleagues shaved their heads, the presidential office proposed the legal voting age be lowered to 18. The constitutional amendment needs approval from two-thirds of lawmakers at the parliament to be put to a national referendum, once it is submitted Monday. Whether the proposal will be approved is unclear at this stage, as the conservative main opposition Liberty Korea Party has been mostly against the notion. The party has said it is “concerned” about the “politicization of schools,” suggesting the first and foremost responsibility of teenage students is to focus on academics. Yet some point out that not all 18-year-olds in South Korea are in school. Also at age 18, South Koreans are legally entitled to marry and work for the government, but are not able to vote. 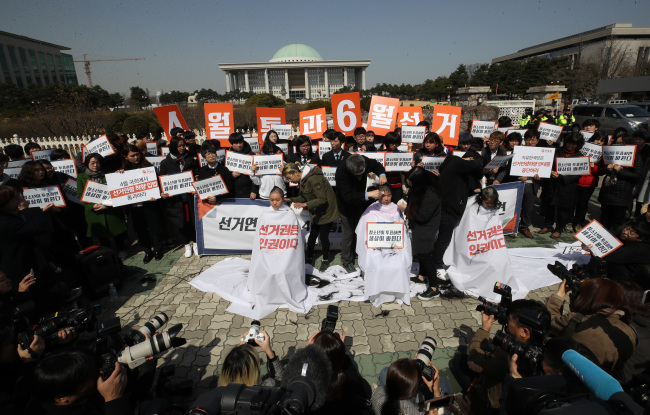 “The fact that this country’s 18-year-olds can work for the National Election Commission, but are not allowed to vote, is ridiculous,” said Roh Hoe-chan, the floor leader of the left-wing Justice Party. Studies show that South Korean teenagers are not uninterested in politics. Research by a local youth rights group, which surveyed some 2,420 teenagers nationwide last year, revealed that almost 50 percent of all participants said they attended the candlelight vigils denouncing former President Park Geun-hye’s corruption scandal and calling for her resignation in 2016. Almost 85 percent of participants said they are willing to be more engaged in the nation’s political and social affairs once their right to vote is guaranteed by the Constitution. Youth activists say the nation’s current voting age -- and the exclusion of teenagers from politics -- is intertwined with the harsh and hypercompetitive environment teenagers here are often forced to endure. South Korean youth suffer the highest suicide rate in the world among OECD countries. The study by the youth rights group showed that 35.3 percent of all teenage participants said they have often experienced physical punishment from teachers at school. At the same time, 40 percent said they have been verbally abused by a teacher at least once. Almost 35 percent said they think Korean society “severely ignores, abuses and discriminates against” minors. The statistics are very much reflected in the life of Kwon. She said she has been physically abused by teachers “countless times” since elementary school. She also said she was constantly exposed to discriminatory and insensitive remarks from teachers in her classes. 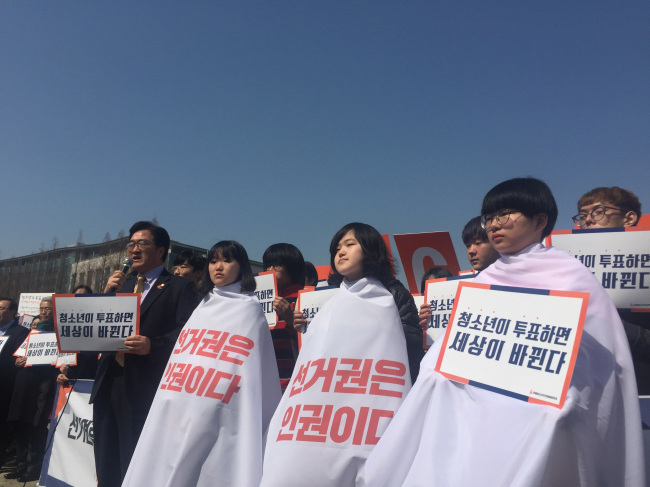 Kwon, alongside other activists, said lowering the voting age will bring changes to the country’s next generation, and ultimately, its future.